← Scala – just good for Java shops? The idea of keeping a diary fills me with dread. It conjurers up distant memories of receiving leather-bound paper diaries from well-meaning relatives at Christmas and the crushing obligation to write something, anything every single day, when actually nothing very interesting was going on. The obligation to do something every day is a sure-fire killer of motivation for me. So, as you can imagine, I have never been keen on keeping a regular diary of research notes and results. Not that I haven’t tried. I have a paper notebook that I use to keep track of discussions and obligations from meetings and at various times I’ve tried to use that as a discipline for writing down ideas and notes from my research work. Somehow though, it never stuck. That is, it never stuck until I read this blog post by Mikhail Klassen on the writeLaTeX blog. Mikhail points out that having a digital diary has some compelling advantages. It allows you to keep track of intermediate results and ideas, links to software repositories and BibTeX citations. This means that next time you need to quickly put together a presentation or poster, or you are starting to write a paper, you can pull figures, citations and text directly from your diary. This is especially useful if a lot of your writing has equations and citations that are time-consuming to keep track of. So, keeping a diary means that a lot of the time-consuming tasks involved at the start of writing a paper or presentation just disappear – those costs are amortized with the costs of keeping the diary. This has enormous appeal to me. The time I get for research is not large, and anything I can do to make my work more efficient makes the process a lot less stressful. So, having looked carefully at Mikhail’s template I was really impressed, but I wanted to tweak a few things. In particular I changed the layout of the whole diary and based my version on the excellent tufte-latex class which is inspired by the work of Edward Tufte. I also added a couple of new sections at the top of the diary – Projects and Collaborations and Someday / Maybe. Projects and Collaborations is there to help keep track of ongoing commitments, and as a reminder that those projects need to be regularly progressed or abandoned. Someday / Maybe is there to keep track of vague ideas that sound good but you aren’t yet committed to acting on. I find it useful to have a list of these, as they can easily get forgotten, and many good ideas which aren’t quite ready for action can be used as student projects or re-purposed. Other ideas can sit around for a long time, but suddenly become useful when a new collaboration comes about, or you find some scientific result or new technology which makes a previously very difficult idea tractable. Lastly, like Mikhail, my template and my own notes are on writeLaTeX, which is a cloud platform for writing LaTeX documents. 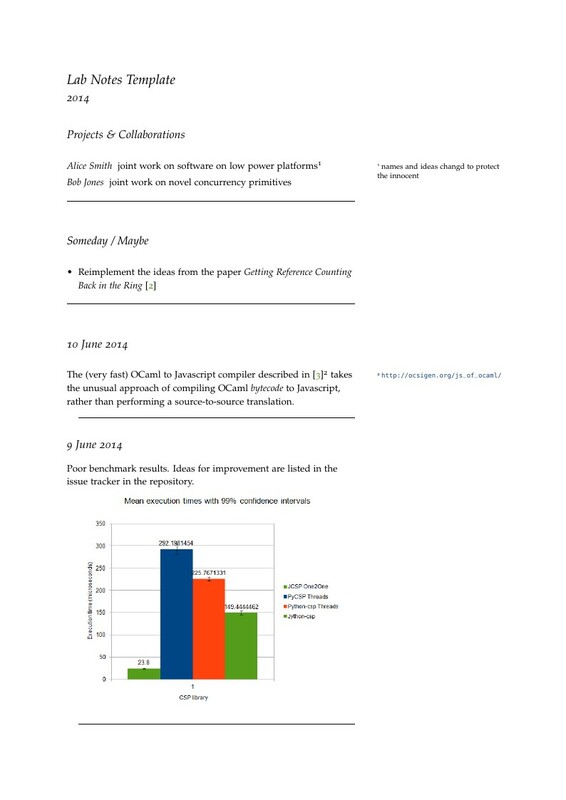 writeLaTeX (and its cousins ShareLaTeX and Authorea) have some great features, like collaborative real-time document editing, auto-compilation so that you can see a current version of the PDF of your document as you type, a wealth of templates and a friendly near-WYSIWYG editor. writeLaTeX can also has a limited sync-with-Dropbox feature for offline work. All of this makes diary entries really simple to write. I just have a writeLaTeX window open in my browser all day and I can write updates and upload new documents as I go along. Oh, and because I have a pathological aversion to keeping a diary, I call mine “Lab Notes”. Much friendlier! This entry was posted in Research, Undergraduate projects and tagged academic writing, advice, best practice, papers, productivity, research, undergraduate projects, writing. Bookmark the permalink.